Cleansing Service Group (CSG) has renewed its support for a national scheme promoting chemistry education. For the second year running, the company sponsored the Salters’ Festival of Chemistry at the University of Manchester as part of an annual nationwide event organised by the Salters’ Institute which plays a major role in promoting chemistry teaching and encourages young people to follow careers in the UK chemical industry. The Institute also encourages the growth of school chemistry clubs who are then invited to take part in the annual festival – held at universities and colleges across the UK and Ireland from March to June – in which teams of 11-13 year olds compete against each other in practical chemistry exercises. Over the last 15 years, over 42,000 students have taken part in the festival which is also supported by chemical and related companies including CSG. 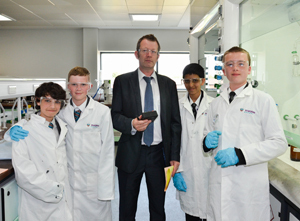 As well as sponsoring the Manchester University event, hosted by the School of Chemistry, CSG provided hands-on assistance when the company’s representative, Dr Stuart Atkinson, joined the panel of judges choosing the winning teams. Dr Atkinson is a member of CSG’s specialist chemistry team working within two company laboratories and researching waste treatment technologies.